Cruise past the glass-faced Shard building – London’s tallest! Your journey along the River Thames begins in the evening at Westminster Pier where you'll board the ship. Stroll the open-air deck and help yourself to delicious canapés as you embark on a two-hour float along London’s famous waterway. Then find a seat in the indoor saloon, enjoy live jazz music and admire unobstructed views of passing city landmarks at sunset. Heading first past Westminster, you’ll get great views of the Houses of Parliament and the iconic Big Ben, followed by the illuminated London Eye and Shakespeare’s famous Globe Theatre, a gorgeous Elizabethan playhouse that still runs regular performances. 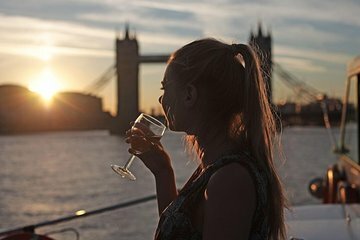 Sip on bubbly wine as your boat cruises under London Bridge and past the Tower of London and the monolithic Shard building – London’s tallest building at 1,016 feet (310 meters) in height. The final leg of your cruise takes you by Canary Wharf, the Naval College and the striking Cutty Sark clipper ship, one of the remaining three clipper ships from the 19th century. From here, your boat will make its way back to Westminster Pier, where you’ll disembark with plenty of time for dinner or evening activities. This sunset champagne tour was great! The hors d’eouvres were plentiful and of better quality than I expected. The view of the tower bridge with a full moon was magical. I wish the boat had passed parliament and perhaps had some commentary identifying the sights, but it was a wonderful night with beautiful views regardless! The boarding was a little confusing. They should have the door they will be using marked so if you get there first, you board first. Just an average river cruise. No one talked about the sights, we were going by. drinks okay. they had a girl singing and would have had a knowledgeable representative talk about the city they love? Service at the depot was not good. Those of us that had vouchers were pushed to the back until those that purchased onsite in London were taken care of. Overall one of my favorite things I did on my 2 week vacation that took me to four different cities. A unique perspective of London with great food and a bar on board. I get motion sickness pretty bad but had zero problems on this tour. the boat itself was clean and comfortable. highly recommended. Wonderful cruise with great commentary. Brilliant views of London. Highly recommended. I would not use glass or ceramic on the boat. We had a few broken wine glasses during our cruise. We had a lovely sunset, great picture. It was difficult to get a clear picture of the tower of London as the river was very rocky. But did get a clear picture of tower bridge. It was a little chilly when we went. So dress appropriately. Very good. Enjoyed it. Would have liked knowing what buildings we were passing. This was an amazing experience...got to see a lot of London up close, the hosts on the boat were very nice, the live music was an excellent touch! Booked this tour for our last night in London and it was a lovely way to end the trip. The champagne and snacks were a great touch as well.